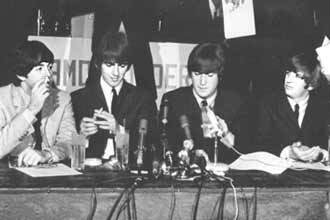 ABOUT THIS PRESS CONFERENCE: On August 23rd The Beatles arrived in Los Angeles as the 5th stop along their 1964 North American Tour. 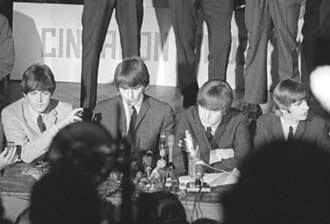 The Beatles gave this press conference just before a concert that would be recorded and later released as The Beatles Live At The Hollywood Bowl. This performance yeilded six of the tracks appearing on the LP. The remaining tracks were compiled from their 1965 Hollywood Bowl performance. When asked during this press conference what Hollywood actress he would most like to meet, Paul McCartney replies "Jayne Mansfield." That wish did come true the very next day as The Beatles accompanied Mansfield at the Whisky A Go-Go club for a special party in their honor, with proceeds going to charity. The Beatles had two days off to relax in Bel Air until the tour traveled onward to Denver on August 26th. Q: "A psychiatrist in Seattle is saying that you are a menace-- You bring out the destructive instincts in teenagers, and you oughta be banned." GEORGE: "Psychiatrists are menaces, too." Q: "Do you plan to visit Iron Curtain countries?" JOHN: "We don't plan our vinits! ...Visits." JOHN: "Our manager does. So ask him." Q: "Would you like to make a film in Hollywood?" GEORGE: "We don't mind, but we make the film where the company thinks it's suitable." Q: "What movie actors would you like to meet in Hollywood?" Q: "Paul, do you guys plan to date while you're in L.A.?" PAUL: "Alright. See you 'round about nine then." Q: "Are any of you fellows athletes? And what is your favorite sport?" GEORGE: "None of us are athletes. No. And we don't particularly like any sport, except swimming." Q: "How content will the Beatles be when they return from here to civilization on the cheap side?" JOHN: "I don't know where that is." Q: Would you care to venture a guess as to how long you think your success as the Beatles might last?" Q: "I asked Elvis a couple of months ago if the Beatles bugged him, and he said not at all, and was really happy about the whole thing. I'd like to ask the boys what kind of opinion the boys have got of Elvis." JOHN: "We've got all his early records." Q: "What happened to the suits they used to wear-- with no collars and the black trim, and all that?" GEORGE: "They're in the wardrobe in mothballs." 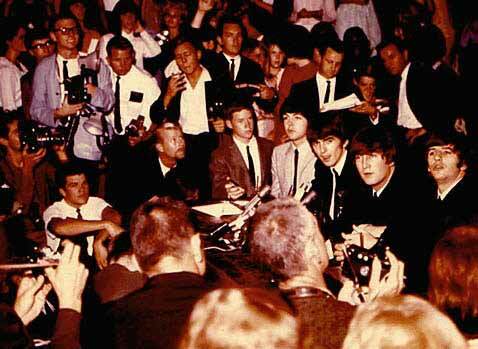 Q: "I want to ask the Beatles what they think of Barry Goldwater." 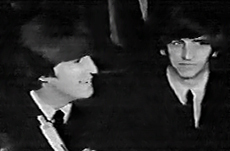 PAUL: (through the crowd noise) "I don't like him... I don't like him... unquote!"